I haven’t posted anything fitness related this semester. I’m sorry guys! This whole applying-to-jobs thing got in my way. So I’ll do a quick post on an arm workout I’ve been doing for a little while. Now I also do the chest press machine and the butterfly for my back and chest, these are just my additional dumbbell workouts. Tricep Dips – you can grab a couple of steps and dip yourself with them. Don’t know how to do a tricep dip? Here’s a video! Dumbbell Curls – I alternate arms and go very slowly for the most effective workout. Also, once I finish a set the normal way, I immediately do a second set with my palms facing each other which works the triceps a little more. Shrugs – Hold your dumbbells in each hand and let your arms rest by your side. Lift your shoulders for three, then drop. Repeat. Military Plank – Mondays Wednesdays and Fridays at the gym are arm and ab days for me, so this move works both. 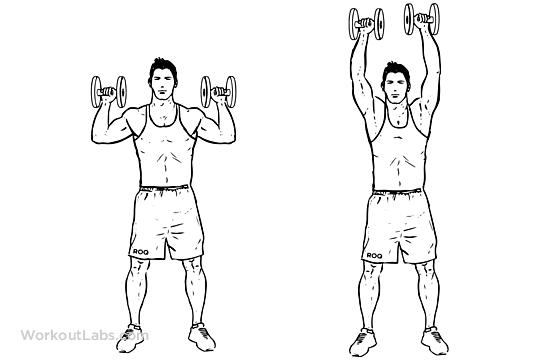 Put your hands together under your chest, then lift yourself up with straight arms. Hold this for 30-45 seconds. It’s called an overhead dumbbell press ! Nice workout ! overhead dumbbell press! I’ll remember that now 🙂 thanks for the feedback!